The scheme is an exemplar of meticulous and good quality external design within an urban residential environment, unifying a diverse variety of buildings and responding sensitively to a designated setting. The project provides a refined example of suburban brownfield remodelling. As a design and build contract this project is an example of modern procurement methods employed to deliver a successful and economic solution which has faithfully and accurately reflects the design intent. Originally conceived in 2007 Macaulay Walk is a mixed use residential led scheme providing 98 dwellings in Clapham Old Town, South London. The site, which lies within the Clapham Conservation area, was formerly a notable optical works for Ross & Co and the proposals sensitively re -uses many of the origin al 19th century industrial structures and with the addition of new buildings, frames an historic pedestrian right of way to Clapham Common. This new street carefully negotiates old and new building footprints to clearly delineate the right of way in the context of a residential environment. Macaulay Walk delivers a high quality landscape that has tangibly benefitted the client, the residents and the local community. 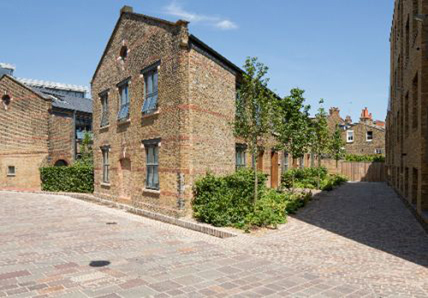 It provides a model for sensitive and characterful suburban brownfield redevelopment and skilfully handles public and private interests which unify a diverse assemblage of buildings and is sensitively integrated within the wider setting of a conservation area. The landscape is robust but also finely crafted and generous; the scheme offers delight to residents, members of the public as they walk through the site, and also offers glimpsed views of new greenery and marker trees from the adjoining streetscape. The Macaulay Walk project is representative of the recent regeneration of Clapham Old Town. There have been recent Public Realm improvements to Venn Street and the reworking of the bus station known as Clapham Gateway along with residential led developments of Wingate Square and individual residential projects along Macaulay Road including the Michael Squire houses. 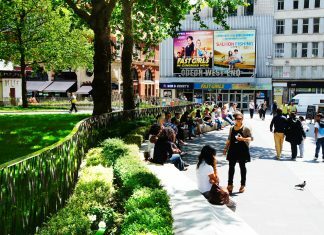 To re-establish Leicester Square as the home of British cinema and entertainment gateway to the West End, a vibrant landmark and principal meeting place where people can sit, relax and enjoy the atmosphere.